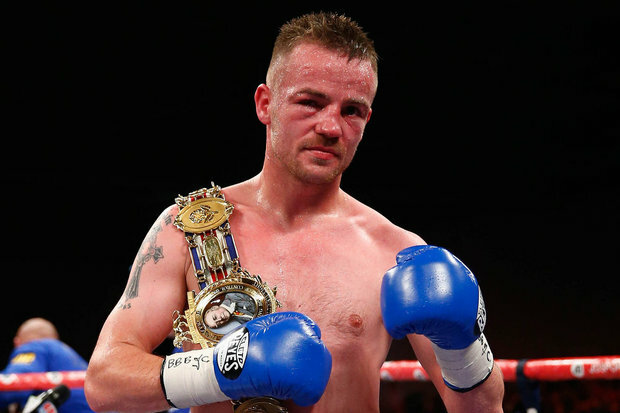 Frankie Gavin’s IBO Welterweight World title fight with Bethuel Ushona has been pushed back a month after the Birmingham pugilist suffered an ankle injury in training. The fight against the Namibian for the vacant title, which was due to be staged at the Genting Arena in Birmingham on Friday February 23, will now be rescheduled to Saturday March 24. Tickets will be honoured from the original date and the undercard – which included two other IBO title fights – is expected to be relatively unaffected. Today Gavin’s trainer Dean Edwards admitted the injury – sustained during the fighter’s recent training camp in Ireland – had been a setback but insisted it was merely a minor one and that Frankie would be fighting fit for the new date in just a few weeks’ time. Edwards said: “Frankie has sprained the ligaments in his left ankle and been advised by medics to cease training for the next seven to ten days. Gavin was sparring over at Paschal Collins’ Celtic Warrior Gym in Dublin when the injury came – six rounds into a session with Irish title contender Jay Byrne. He was splitting his time between the gym, owned by the brother of boxing legend Steve Collins, and the Crumlin Road gym ahead of his showdown in the Now or Never World title bout in his home town next month. The show, hosted by BCB Promotions and sponsored by BWI, was seen as the last real chance for the 32 year old. Edwards explained: “It was a great session but Frankie is a southpaw and Jay an orthodox and unfortunately as they came in their feet touched. It happens a lot in boxing. Frankie went to duck a blow and just went over on his ankle. “We immediately stopped the session and iced it and elevated it up but the swelling wouldn’t go down. “We took Frankie to the County Meath private clinic here in Dublin where he was seen by Dr Michael Tierny. “He confirmed it was ligament damage and signed Frankie off training for a week to ten days. “Frankie is absolutely devastated – just gutted as it was going so so well. But it’s a minor problem. He made the weight check ins with both the English and Irish Boxing Board of Control recently and was looking the best and the sharpest we’ve ever seen him. A spokesman for the Genting Arena in Birmingham today confirmed all tickets sold for the fight which has been rescheduled to Saturday March 24 would still be valid for use.